Brides get excited about their weddings. As a florist you have the ability to help the excited bride fulfill the dreams for her big day while staying in their budget and gaining the satisfaction of knowing you provided one of the most central pieces of a wedding - the flowers. When brides start planning their wedding they look at bridal magazines, Pinterest, Instagram and tons of other sources for inspiration on their dress, cake and flowers. Providing these gushing brides-to-be with a source of inspiration on your florist eCommerce website not only leads to them making choices, it also leads them back to your website repeatedly, keeping your florist in their minds. The Media99 Florist Wedding Gallery does just that – and more. Our wedding gallery features high-quality photos of bridal bouquets, centerpieces, cake flowers and wedding party pieces to make your client go ooh and aahhhh. In addition to viewing the photos, the brides can click though to the wedding consultation form and send you an appointment request as well as download a bridal flower checklist, branded with your florist’s name, to make notes about their plans. This checklist can be brought with them to the consultation to help organize your client’s thoughts, which in turn helps you in determining what is needed and what will fit their wedding flower budget. 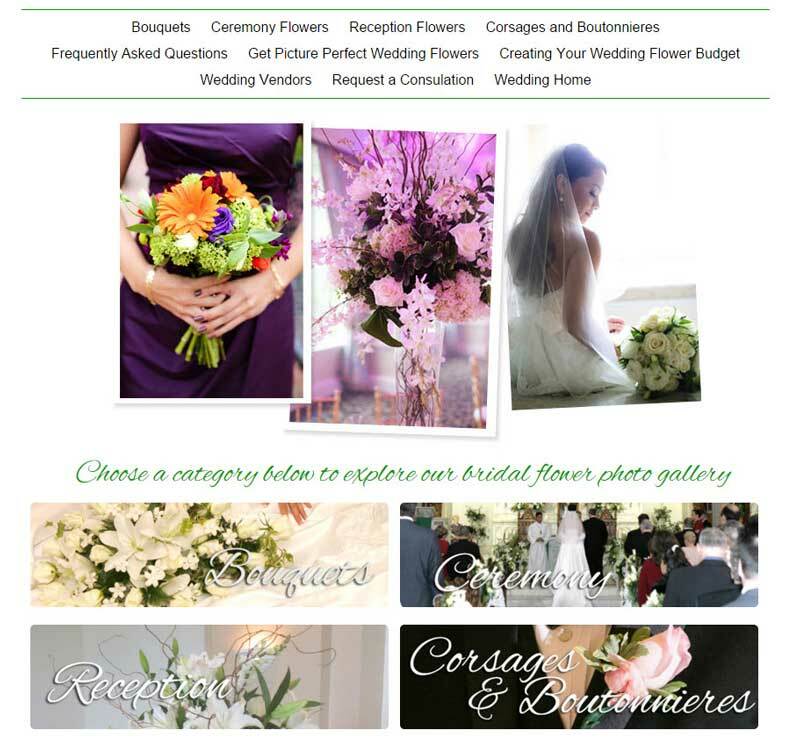 The standard florist wedding gallery is a turn-key solution for your florist eCommerce website. No matter which florist website design you have chosen with Media99, the standard gallery is made to fit with your site. You don’t have to buy another website just to host a wedding section for your florist business. Our florist wedding gallery also adds wedding-related content to your website, which is key if you want to be picked up in the search engine results by brides looking for a local florist to fulfill their wedding flower needs. There is a one-time setup fee of $150 for this gallery to be put in place on your website. There is no monthly fee for maintenance. The custom version of the wedding gallery is built on the same platform as the Standard version, therefore it will fit within your florist eCommerce website. The difference in the custom wedding gallery is that we use your images. You provide us with the images you want to use, the wedding image categories you want, local venues, etc and we put this all into your wedding section. With the custom version of the gallery you can assign names to the images, and you and your bridal client can use this for reference when discussing your wedding flower services. The setup for the Custom Wedding Gallery is a one-time fee starting at $250, and increasing in price based on the number of images used (150 images are including in the $250 base setup fee). 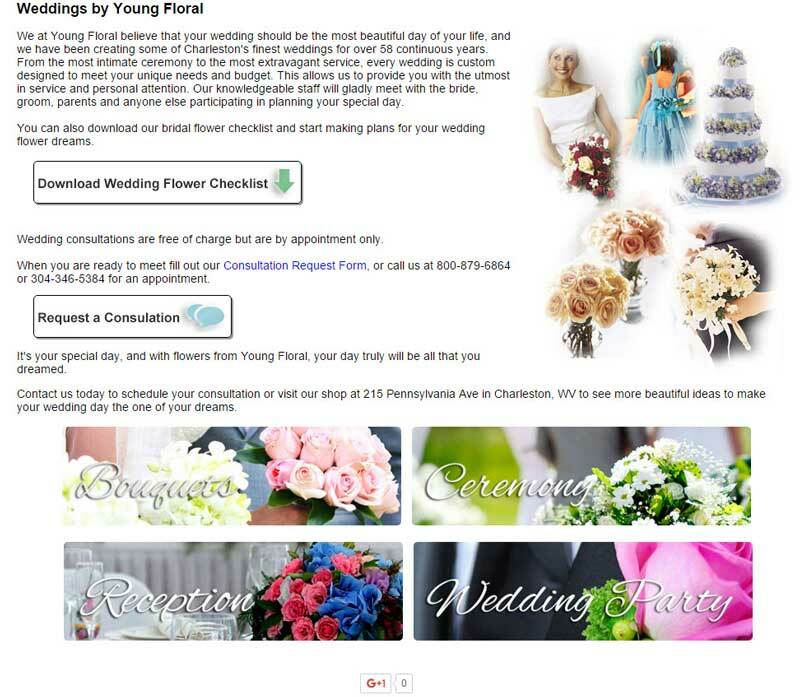 Either way, Standard or Custom, the Media99 Florist Wedding Gallery is a great addition to your florist eCommerce website if you want to generate more wedding flower business leads. It opens up communication with potential bridal clients and allows you to qualify your leads and clients based on their budget, wants and needs.